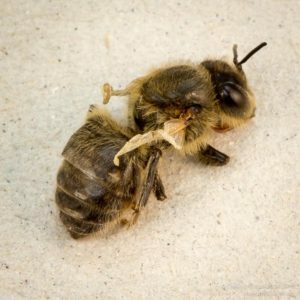 Deformed wing virus (DWV) is probably the most important viral pathogen of honeybees. 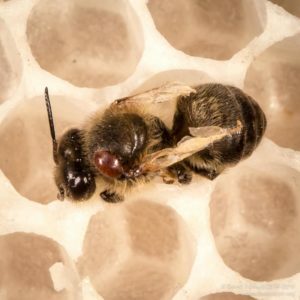 In the presence of Varroa the virus is amplified to very high levels in the colony, resulting in newly emerged workers – those that survive long enough to emerge – exhibiting the classic symptoms familiar to most beekeepers. These include deformed or atrophied wings, a stunted abdomen, additional deformities or paralysis of appendages and (not visible) learning impairment. There is a clear association between high Varroa levels, high levels of DWV symptomatic bees and overwintering colony losses. These images are of workers from a colony treated for a month with Apiguard to reduce mite numbers. Many bees remained with symptoms. I suspect the high levels of mites pre-treatment resulted in the amplification of virulent strains of DWV which continued to cause disease even after the mite numbers were reduced. This emphasises the need to monitor mite numbers and treat appropriately with Apiguard, oxalic acid or – during the season – other appropriate integrated pest management practices such as drone brood culling. 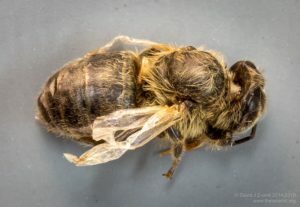 This entry was posted in Beekeeping, Diseases, Photography and tagged Apiguard, disease, DWV, health, oxalic acid, pictures, virus on October 17, 2014 by David. Varroa levels seem to have been high this year (maybe because good weather meant large, successful colonies?) and I saw some of these poor bees in our hives for the first time. Really upsetting to see. Colonies here had variable levels of Varroa, they certainly weren’t all high. We had a real shortage of forage in early/mid August, resulting in a brood break. I treated with Apiguard when the majority of mites were phoretic and hope I’ve knocked them back enough to get them all through the winter. Interestingly, with the use of foundationless frames in many of my colonies the hives have a much higher number of drones present … this should create a great breeding ground for Varroa but I had little or no DWV problems in these colonies this year. In contrast, in previous years I’ve prepared drone raising colonies for queen rearing and really struggled with DWV late in the season. A far from scientific comparison, but it will be interesting to see if this pattern is repeated in future years.